Students See The Cost of College In Ping-Pong Balls – Jacob Reed. Creative Director. Thrivent wanted to break down student loan debt into something easy to understand, and maybe even fun enough to share with friends. To solve for this, we contextualized tuition expenses with tangible objects, illuminating the cost of college right before students’ eyes. The humorous gamification of a normally daunting subject matter helps bring the audience in so that they’re fully invested when the more surprising truths are revealed. Of course, the visual of someone literally drowning in debt didn’t hurt. This campaign drove awareness of Thrivent’s message of financial literacy and viewers comments and share statements are proof they left the video having a better understanding of their debt. The hero video has 30k social engagements with a 94% positive sentiment on YouTube. 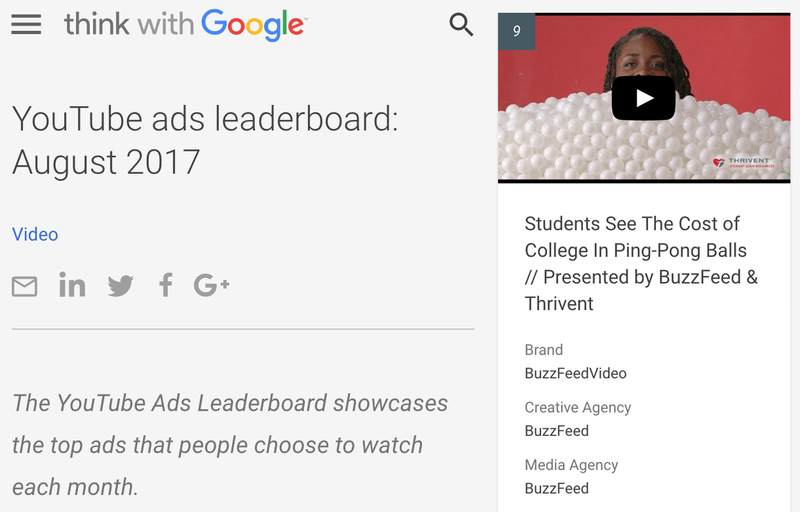 It also made the top 10 in YouTube’s Ad Leaderboard for August 2017.